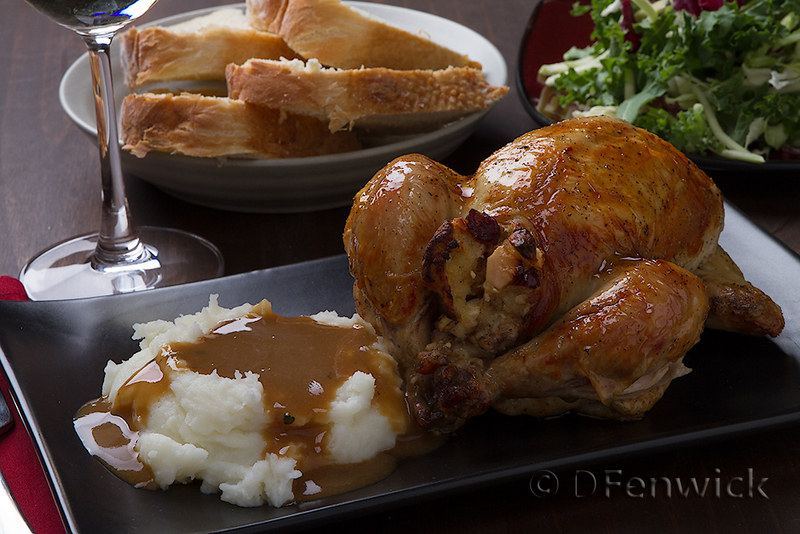 Holiday dinners don’t always have to be made for large crowds of extended family. Tonight’s elegant looking meal is actually very easy to create – which gives you more time to spend with your special someone. Let’s get cookin’! Lightly toast your bread (or use slightly stale bread). Cut into small cubes. Coarsely chop your apple and add to the bread. Coarsely chop the dried cranberries and add to the stuffing. Add the feta, 1/2 teaspoon each crushed rosemary and crushed thyme. Add 1/4 teaspoon each salt and pepper. Add 1/2 cup chicken stock and gently stir to combine the ingredients. The bread will absorb the chicken stock. Wash the game hens and be sure the body cavity is clean. Stuff with the stuffing mixture. Tie the legs to hold the body cavity closed. Brush with Olive Oil and sprinkle with salt and pepper. Place in a baking pan on a baking rack. Bake covered for 30 minutes. Uncover and bake an additional hour or until the internal temperature of the stuffing and the thickest part of the game hen is 165 degrees. Bake any remaining stuffing mixture in a baking dish until it reaches a temperature of 165 degrees. Serve with mashed potatoes and gravy, vegetables and pumpkin pie. Although this is the season of “thanks”, we hope you find something each day of the year to strengthen your attitude of gratitude. We are very thankful for all of you that have continued to check in our adventures in cooking. Have a happy and healthy Thanksgiving. I had to jump onto the pumpkin spice bandwagon again – if only for a brief flirtation with it’s seductive seasonal charms. Marshmallow Madness by Shauna Sever is a great book that takes you step by step thru the marshmallow making world. My instructions won’t give her detail justice – so be warned, and buy the book! 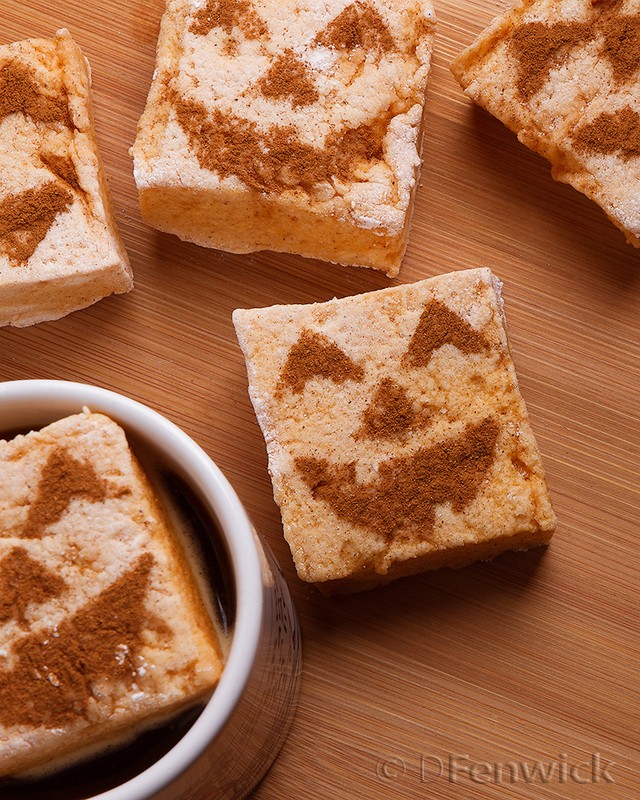 I’ve also adjusted her pumpkin recipe slightly to make for a more personally appealing mallow. I enjoy spices, so I cater to that. I’ve used these marshmallows in my coffee AND layered between pancakes hot off the griddle – oh yes indeed-ie! My secret to success was preparation. The mallows come together really quickly so having everything prepped and ready to add was key. Let’s get cooking! First and foremost an electric mixer with a whisk attachment. We’ve killed a hand-held mixer making Divinity, so be kind to your kitchen tools and just go for the larger mixer. 1.) Prep an 8×8 baking pan with your oil of choice. I used coconut butter, but whatever your tummy can tolerate to keep the mallows from sticking will work. 2.) In a microwave safe bowl mix the gelatin & 1/2 cup cold water well and set aside. 3.) Into a medium sauce pan mix the sugar, 1/4 cup of corn syrup water and salt. You’ll want to heat this to a boil and 250 degrees F. Keep an eye on this and stir occasionally. While this is heating, into an electric mixer bowl pour the remaining 1/4 cup corn syrup. 4.) Take the gelatin bowl from Step 2 and heat in the microwave about 20-30 seconds depending on your appliance. You’ll want this melted. Pour into the electric mixer’s bowl and mix with the corn syrup on low. 5.) Last bit of prep – while the sauce pan is still heating to 250 degrees F, and your mixer is keeping the gelatin from solidifying, mix the last of your ingredients together in another bowl (pumpkin, cinnamon, nutmeg and vanilla) and set aside. 6.) Once the heating corn syrup reaches 250 degrees F carefully add this to the mixer. Syrup flung onto the sides of the bowl will not make for good marshmallows. Once added to the bowl increase the speed to medium for 5 minutes, then increase to medium-high for 5 more minutes, then to high for 1 minute. Add the pumpkin mixture, return to high speed for 1 minute of mixing. You can add coloring at this point if you have a preference. 7.) Carefully pour the marshmallow mixture into the prepared pan, spreading it into the corners and flattening it as best as you can. Now take your dusting powder and sprinkle all over the top. Set aside. Overnight is good. In the morning sprinkle the dusting powder onto your cutting board and layout the marshallows cutting to your preferred size. Roll in more powder to keep them from sticking together. We made a template of pumpkin faces and used cinnamon sugar to make the face.